i love that image ..where is it from ??? i was right ,it is a dragon . much prettier than my dragon !!! don't need a blog ? Lovely image and pretty papers you have used for this one. Oh I do like this one. Your colouring just gets better and better! It's a Digi Doodle Shop image Kim called Louis and Daisies. Oh, that's smashing Ruth. Love it. Steph, I did answer you when you asked before hun. The Crafty Pad will accept email entries (in which case you'd email it to me ) and there are a few others too. If I come across them I'll let you know. It's lovely, I like the birdie papers too. 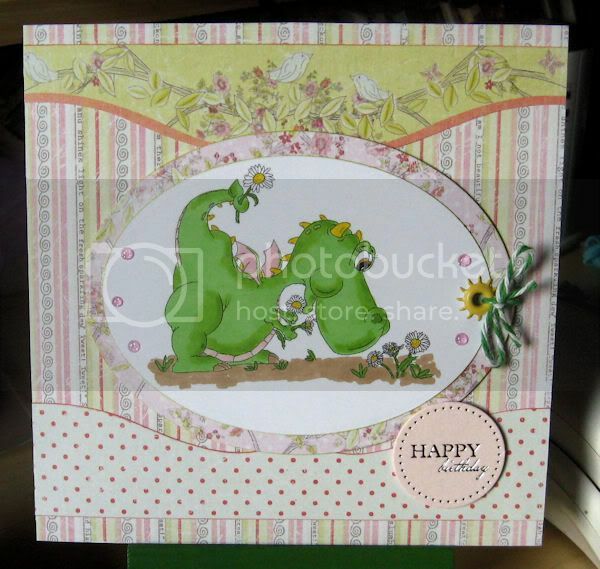 Oh really love this card the dragon is great.